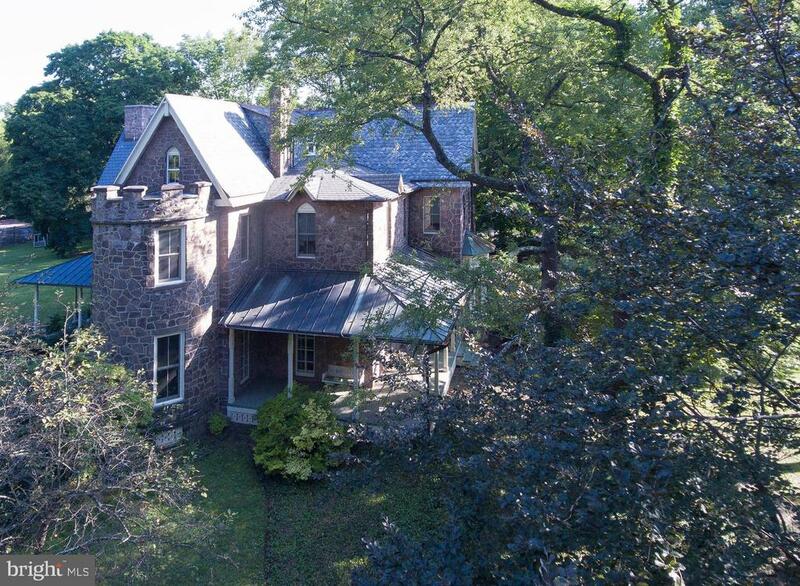 All Doylestown homes currently listed for sale in Doylestown as of 04/21/2019 are shown below. You can change the search criteria at any time by pressing the 'Change Search' button below. If you have any questions or you would like more information about any Doylestown homes for sale or other Doylestown real estate, please contact us and one of our knowledgeable Doylestown REALTORS® would be pleased to assist you. "If you love historic charm yet desire today's modern luxuries this elegant estate is calling. Located in Central Bucks School District with easy access to Philadelphia and New York City. This unique property consists of 2.4 acres including an expansive manor house, stone spring house with a spring fed pond and an impressive heated pool. There is also a charming two bedroom cottage complete with a full kitchen, and one and a half baths that is revenue producing. The backyard is by woods and borders a 108- acre Central Park with trails, athletic facilities and open space. The home epitomizes quality construction, architectural details and countless amenities. The home started in 1740 as a simple two-room structure. The major additions to the house occurred in 1950, 2000 and 2006 so there is an exceptional impression of spaciousness and unlimited storage spaces. The manor house has been completely updated and over 7,000 square feet of new construction has been added with nine HVAC zones. In total there are 6-9 bedrooms, 7 working fireplaces, 6 full baths and 2 half baths. There are several leisure areas for entertaining including a tavern, billiards/game room and a gallery. Don't miss this opportunity to own a magnificent homestead." "As you come into the drive you will pass through a myriad of naturally planted specimen trees, shrubs and grasses until the residence appears as if it were a flower gracefully opening. This Ultra-Modern Home is set so that it appears as if to naturally grow out of the ground. Anchored with natural stone and cantilevered with it's Corten steel and glass exterior, this dramatic design floats above the verdant meadows and commands beautiful vistas from every room. The 11 foot tall glass walls offer uninterrupted interaction with the natural order beyond. Mechanical roller shades offer the option affording privacy from deer, sheep and flying birds. This Ultra-Modern masterpiece will also offer self-sustaining features incorporating solar and or wind generators (silent and bird friendly). In addition to the main residence an additional pool house, guest house, studio or detached garage can also be incorporated into the overall scope of the project. 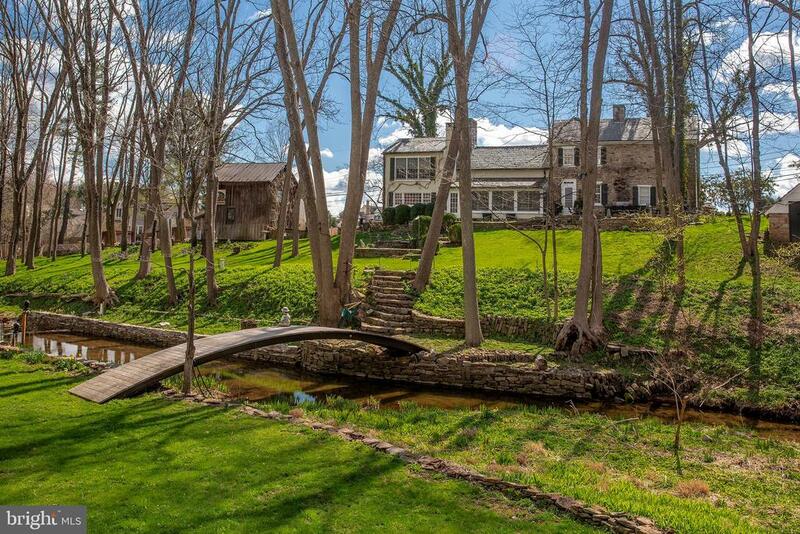 Once again, the property offers bucolic views of Bucks County at its finest and you are 5 minutes from Doylestown. Please contact Marco Polo for an opportunity to learn more about this estate property and what can be done to make it the perfect home for you to live life to its fullest. You can also peruse Polo Design Build on the web to see the other styles that the firm is capable of developing to meet clients needs." "Bucks County Perfection ? Centrally located minutes to Doylestown, the county seat, well known sister towns of New Hope and Lambertville both on the Delaware River plus all that this area has to offer. 70 minutes to NYC, 55 minutes to Philadelphia and 40 minutes to Princeton. This estate property is set on a 14+ acre parcel where privacy is shielded with large trees a long winding drive and flowing manicured lawns. The home is a modern day reproduction of the uber classic stone farmhouse. The home is energy efficient with geothermal zoned radiant heat. All of the boxes are checked for someones wish list. 10 ft ceilings throughout, world class design, voluminous rooms coupled with intimate spaces, walls of windows and French doors, magnificent kitchen, 4 chimneys featuring 5 fireplaces, an over the top wine cellar, home gym and finished basement. Every detail has been executed with top of the line materials and a well thought out design. A one of a kind property which must be seen to be appreciated." 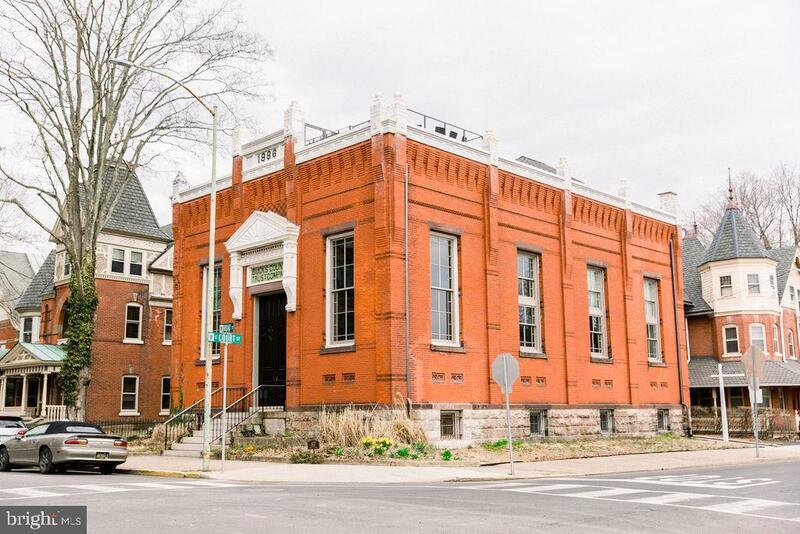 "Complete restoration, renovation and expansion of an iconic Doylestown Boro building in conjunction exclusively with Jarrett Vaughan builders. Plans and renderings available upon request. Site tour can be scheduled. 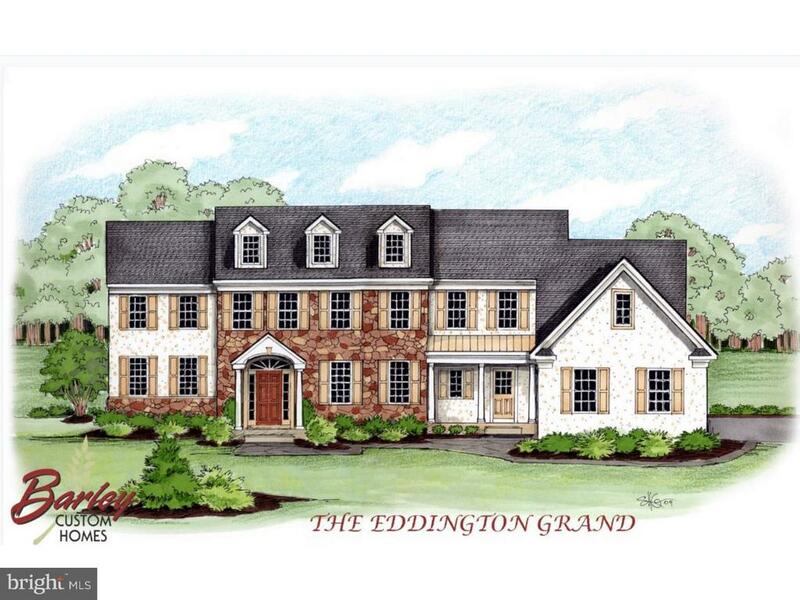 Opportunity to customize your dream home within walking distance to all Doylestown has to offer." "In the heart of Doylestown Borough, this historic building has been brilliantly re-imagined into a trendy upscale residence. The faded words Bucks County Trust Company remain etched in a transom window over the former Broad Street entrance, a reminder of this brick structure's original purpose when it was built in 1866. Beginning in 1933 this building became known as the Melinda Cox Library and eventually served the community as part of the Bucks County Free Library System. The Controller's Office began operating here in 1988, where it remained part of the Bucks County Courthouse for many years. Newly finished into an impressive 5,000+ sq.ft. residential home with 24' ceilings and windows to scale. Sunlight floods into three levels of living space plus a rooftop terrace, where the Philadelphia skyline may be seen on a clear day. Timeless pieces of architecture were found and preserved during the process, including the exciting discovery of 11' tall front pocket doors inside the vestibule. The residential transformation incorporated modern amenities into the home's design and premium materials were used to offer all of the comforts of today's lifestyle. The warm ambiance of this space invites residents to thoroughly enjoy this wonderfully re-purposed building in it's newfound glory. Office zoning allows the option to lease the ground level as professional offices, or operate a home-based business right across from the Courthouse. Plans for a parking garage going in across the street." "Beauty, warmth and exquisite craftsmanship are the hallmarks of this meticulously renovated reclaimed barn designed by Wolstenholme Associates. Secluded on over 11 naturally landscaped acres, the home features sweeping vistas of the lush surrounding countryside. Gleaming wide-plank floors, large fireplaces, beamed ceilings, exposed stone walls and sliding barn doors evoke a sense of rustic and provincial, while poured concrete floors, soaring ceilings, industrial details and state-of-the-art geothermal heating and cooling make the home elegant and contemporary. Enter to a dramatic and breathtaking view. The minimal-framed large panel sliding glass Nana wall system offers full floor-to-ceiling sliding glass panels for a picture frame effect showcasing the gardens, patio and pool. The glass invites the outside in and removes visual barriers to allow for an expanded sense of space while providing a transparent shield that protects from weather. An architectural three story stainless steel staircase is a masterful centerpiece of the home and leads to all three levels, as does a private elevator within the silo. The gourmet kitchen is fit for a chef, featuring custom contemporary cabinetry, stainless steel Wolf appliances, a Venetian plastered backsplash and glass doors to the patio for poolside grilling and dining al fresco. The second floor boasts a cantilevered balcony overlooking the living space. A catwalk with a built-in custom bookcase and a wall of windows leads to the grand Master Suite with a gracious walk-in closet and a spa-like bath complete with Waterworks fixtures and a Conch-style shower with mosaic glass tile. A wall of windows open to the balcony with a built-in firepit overlooking the lush grounds below. Two sunny en-suite bedrooms round out the second floor and a media room with a projection TV, the third. Guest quarters in the adjoining second barn boast an en-suite bedroom with steam shower and a 3 car garage. From every vantage point, whether insid"
"MOST EXCITING OPPORTUNITY in ALL The BORO! This AMAZING, DRAMATIC W/ Grande 13' ceilings Previously renovated 1985 Historic Home (The Darlington House) TO BE RE-Renovated at the Above list price by Mack and Roedel Custom Builders. Choose your cabinets, Choose your Colors, Counter tops and more because this MAGNIFICANT SPACE will include a BRAND NEW KITCHEN, NEW BATHROOMS, Flooring upgrades , ALL NEW PAINT throughout! New Glass Doors to a gorgeous NEW slate Patio overlooking large & Private backyard tree lined with mature pine tree transplants. New Driveway to be paved in with motor courtyard and New 3 car garage! New Landscape Design! Mack and Roedel are waiting for you to let them know WHAT STRIKES YOUR FANCY? OPTIONS: Would you like to add a pool? Pool is already approved(optional)! Are you a car enthusiast? Mack and Roedel can add lifts in the oversized garages(optional)! Would you like an Elevator? We can add the elevator(optional)! THIS is a 3 MILLION DOLLAR Home for $2,296,000. 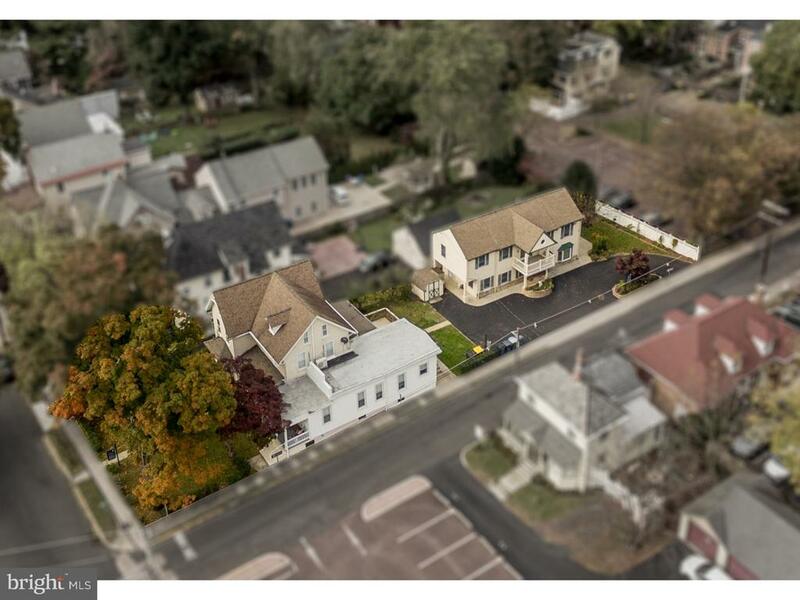 YOU will benefit from the Equity in this PRIME DOYLESTOWN BORO REAL ESTATE!" 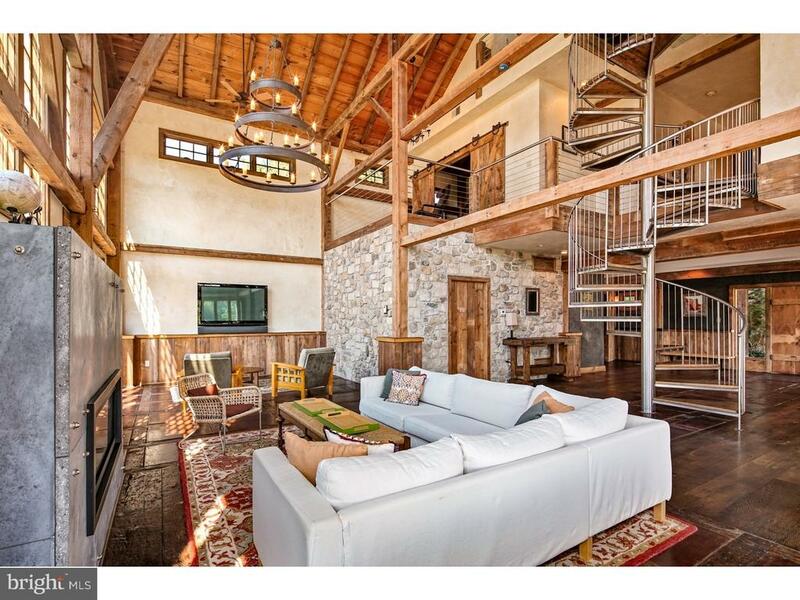 "Refined Farmhouse framed by magnificent grounds. This home speaks to the romance of an 18th century farmhouse that has been completely transformed to an updated, secluded retreat. A Designer Kitchen with Italian marble, custom cabinetry, farmhouse sink, stainless steel Viking and Sub-Zero appliances, wine refrigerators, pot-filler and large kitchen island brings classic timelessness. The Kitchen is complimented by a breakfast and Hearth Room with fireplace. There are wide-plank floors throughout the home, and beautiful glass pocket doors can offer privacy in the spacious Gathering Room anchored by a gorgeous stone fireplace. The Dining Room blends the rustic charm of the original wooden beamed ceiling and stone fireplace with elegant fixtures and double doors leading to an incredible outdoor space and respite. The covered terrace is a wonderful addition to the property offering year round living, dining and entertaining. It features commercial heaters, Lynx grill, kitchen, bar area, double story stone fireplace and views of the landscaped grounds. Peaceful water features are located throughout the property, along with a saltwater pool in the garden oasis. The pool is complimented by a pool house with sets of french doors that open and highlight a casual seating area, bar counter and open loft space. The 2 story car garage has been reinforced for car lifts, offers an industrial style gym area and an outdoor rooftop terrace with seating area and fire pit. Guests will not be disappointed in their own self-contained guest cottage. Dog lovers will appreciate the separate kennel and dog run which can have a multitude of uses. Additional amenities include: Sonos sound system throughout, updated baths throughout, oversized copper tub in the master bath, irrigation system, natural gas, pool house washer, dryer and refrigerator. The public record square footage does not include guest house, pool house or outdoor kitchen. 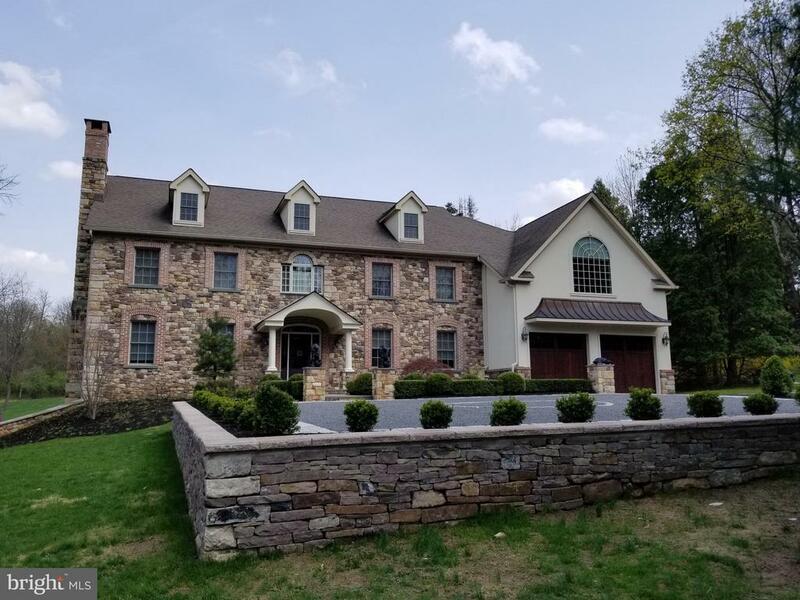 This home is meticulously maintained and only minu"
"This Estate home was handcrafted by Richard Zaveta Custom Builder and sits majestically on a 7.34 acre parcel in the community of Buckingham Township. Exquisite attention to every detail and meticulously handcrafted, this home is full of custom amenities! Enter down a long drive with convenient circular driveway and detached heated 8 car garage with indoor basketball court! There is additional parking for guests and an outdoor basketball court as well. The grounds are professionally maintained and features custom paver walkways and patios. The rear yard features in ground pool, custom patios and built in gas grille, perfect for outdoor entertaining! Enter through a dramatic 2 story grand foyer with stunning chandelier and sweeping staircase! Formal living room with fireplace, French door entry to the formal dining room with access to the well equip Butlers Pantry. The kitchen is fit for a gourmet chef with tope of the line appliances, Wolf 6 burner stove, double wall oven, microwave, center island with vegetable sink, Sub Zero refrigerator and walk in pantry. Large breakfast bar with stools for additional seating divides the sun drenched breakfast room from the kitchen area. A stone fireplace adds warmth to the breakfast room as well. There is a full bath and 3 season room with access to rear grounds, pool and patio, Convenient 1st floor study with custom built-ins, an additional casual living room with walls of windows, fireplace and recessed lighting. Adjacent, a sunken family room for gatherings. Adjacent to the gourmet kitchen is an additional Trueblood inspired and built Great Room addition which is the ultimate entertainment center. Featuring custom box beamed ceilings, wet bar and a wall to wall stone fireplace just a perfect way to enjoy watching professional sporting events with friends. Above is an exquisite master suite with sitting room, 2 walk in closets and opulent bath with magnificent long distance views. The 3 additional bedrooms have the benefit o"
"Doylestown Borough's New Construction Luxury Home features 4 / 5 bedrooms with 4.5 Baths. This unique house offers 4,200 sq. ft. of living space with an additional 600 sq. ft. of bonus areas and a 1,717 sq. ft. walkout basement. Designed and constructed with every attention to detail with special build-in touches for the discriminating taste. Designed by the Award Winning Architect Mark Asher this house offers the latest in Luxury Design concepts for the most Luxurious Life Style. One of many ultra luxury features is the House Elevator accessing the main and second floors including basement level. A large gourmet kitchen is a working space that is a Chef's Dream. Hardwood White Oak floors throughout the house also graces the Open Floor Concept. Stunning trim packages includes, Wood Crown Molding and 10 inch Floor Trim on the first and 2nd floors. Ten foot Ceiling on the first floor with 2 thick Solid Mahogany Doors adding to its Quality and Elegance. A spacious Master Bedroom shows off elegant touches with a large walk-in closet and a bodacious master bath that create a wonderful retreat. The spacious second, third and fourth bedrooms features private baths and elegant trimmings. Integrity in building this fine house is second to none. One can say, this house is built like they use to build them. Poured concrete basement with 9ft. ceiling height make for additional living and or storage space. Create your own theater style, entertainment cave and wine cellar. A two car carriage house style garage connects to the main house by an impressive mudroom. By far the Ultimate Doylestown House !" "There is no substitute for the eye of an architect when designing a home for a special site. 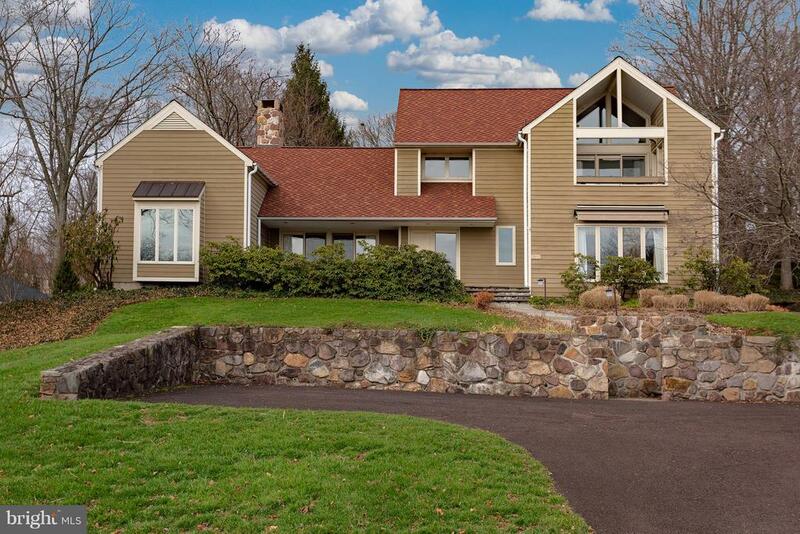 A creation of architect Lynn Taylor, builder Bruce Lesser and landscape architect Carter van Dyke, this 3,024 SF residence with separate guest house is in a prime location in Doylestown Borough overlooking the Doylestown Country Club. Taylor has made the most of its views and natural light; Van Dyke handled setting, lined in stone knee walls with gardens offering visual interest in all four seasons. Its sun-splashed interiors are open and airy with an emphasis on indoor/outdoor flow. Taylor, known for his smart placement of windows, made sure both the house and the ~potting shed~ (the guest house/office/garage) capture the golf course views. Its main living spaces are open and accommodate a traditional or modern aesthetic with hardwood floors in most of the first floor. The living room with gas fireplace has two sets of French doors: a front set opens to a front patio and a rear door opens to the backyard. A centerpiece of this residence is a top-quality 2015 kitchen designed by Charles Weiler. The copper farmhouse sink inspired a custom copper hood topping the six-burner gas cooktop and custom pendant lights over the spacious island. Appliances are Jenn-Air and Sub-Zero. The natural cherry cabinets are topped in granite and ceramic, stone-like tile covers the floor. A harmonious final touch is the ledger stone backsplash behind the cooktop. Dine by the window with its own built-in seat, or use the adjacent formal dining room, which also has access to your summer ~living room,~ a spacious screened porch ready for al fresco dining or lounging with a TV at the ready. Step down from the kitchen to a family room with yet more verdant golf course views. Two good-sized bedrooms, one now used as a den, a full bath, powder room and laundry room complete the first floor. Upstairs is the main bedroom suite with volume ceiling, walk-in closet and dressing room lined in built-ins and a "
"This spacious penthouse, located within the Borough of Doylestown Historic District could be your next home or weekend, country getaway from NYC or Philly. Historic elegance and minimalist chic combine in this complete renovation and restoration of the original 1913 Moose Lodge. Within walking distance to the historic County Theater and Doylestown's fine dining and shopping district, this 4,000+ sq. ft. condominium is truly one of a kind in the Borough. 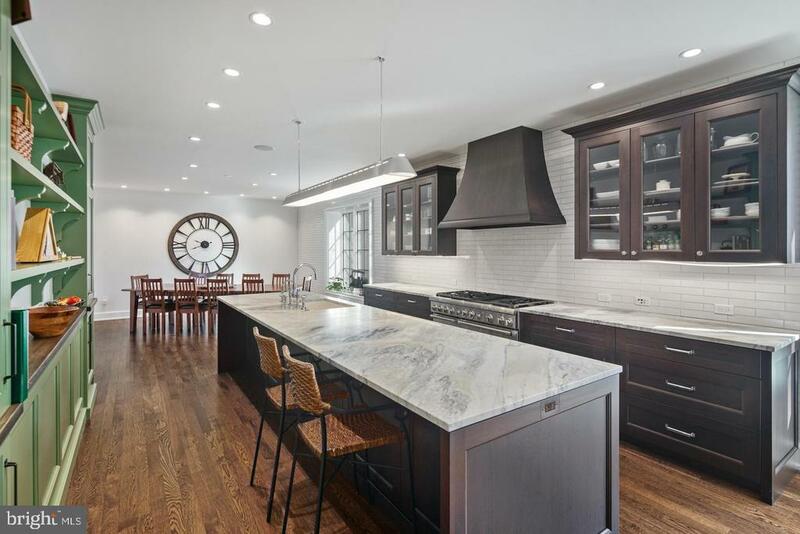 Quality attention was given to all finishes including tiling, marble and soapstone counters, cabinetry, custom lighting and hardwood floors throughout. Enter by stairs or your private elevator to the 2nd floor. From the foyer, you have equal access to the relaxation of your family room or social hosting in your spacious living room with cozy fireplace. Doylestown's own historic Moravian tiles surround the gas fireplace. The living room is sun-drenched, southern exposure exuding the perfect amount of warmth for your morning coffee. Serve drinks from your owner-built, craftsman style, dry-bar and cabinet area with Moravian tiled backsplash. The gourmet-styled kitchen features Thermador appliances, marble counters and exceptionally large island with breakfast bar. An abundance of cabinets and counter space, custom cabinetry with extra storage and shelving, including Perlick wine refrigerators at each end. A large, walk-in pantry completes the kitchen. Flow seamlessly into the adjacent dining area for the perfect hosting setup. Move directly from the dining room into the family room, which delivers another custom-built media center and bookcase. A second Moravian-tiled gas fireplace is located in the study that can also be used as a work-from-home office. Two of the three spacious, ensuite bedrooms have large walk-in closets with custom cabinetry in the master. The master bath offers a spa-like atmosphere. The laundry room storage cabinets is located conveniently across the hall from the master bedroom. The back entrance"
"Just five blocks from the center of town, this grand white house on the hill offers lush privacy with Antebellum style. Its exclusive borough setting is extraordinarily private, yet features two completely separate, alternate street entrances. Set on 2.27 sub-dividable acres, in the heart of Doylestown Borough, the wraparound front porch provides an idyllic setting for summer evenings and Sunday paper reading. With original random-width pine floors, three fireplaces (surrounded by Mercer's renowned handcrafted tiles), plentiful windows, a 21st Century kitchen designed in the Draper style and top-quality appliances, this exceptional home is an elegant and comfortable place to entertain and live. The first floor includes the formal living and dining rooms, family room, full bath, office/in-law suite with private entrance, as well as the open kitchen and breakfast room that overlook a peaceful brick patio, and expansive back yard. Four bedrooms on the second floor have been updated to accommodate a modern lifestyle, offering plenty of closet space and two full baths. A fifth room makes for an ideal dressing suite or personal library. The 3rd floor features a unique retreat area ideal for an au pair also with its own full bath. Offered for the first time in over 50 years, this special property offers true in town living with easy walks to the museum district, the best restaurants and great shopping. It's the perfect atmosphere for garden parties, special family gatherings or just secluded afternoons away from it all." 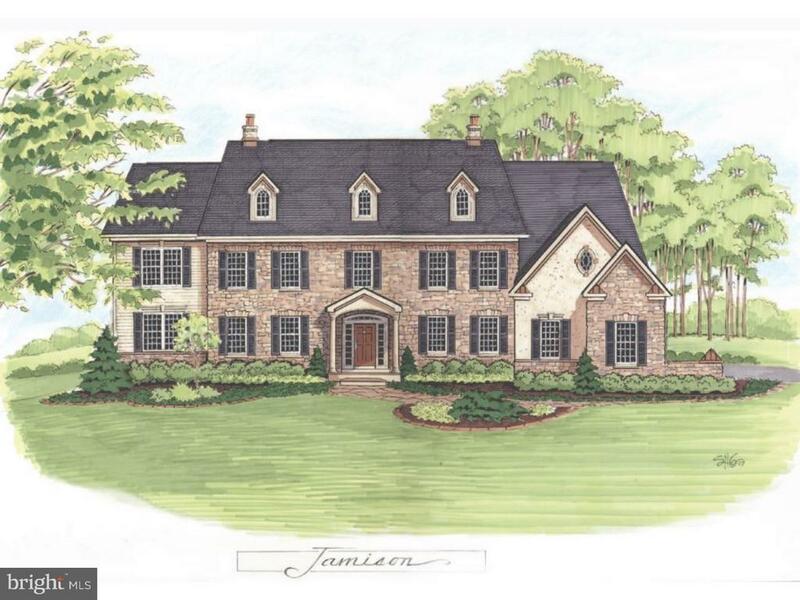 "Last opportunity to build a custom home, in this enclave of luxury homes, with public sewer and natural gas in Central Bucks School district. For 20 years, Barley Homes has been building the upmost quality custom homes offering the finest materials starting with the exterior Lifetime dimensional roof shingles, Stone or brick veneer, stucco front per front elevation plan, and low maintenance HardiePlank siding on the sides and rear over HydroGap drainable house wrap. Inside, the Eddington Grand floorplan begins with a covered porch entrance and two story foyer with painted riser staircase. 5 wide Engineered hardwood carries throughout the entire first floor of the home as well as the 2nd floor hallway. Off the foyer the dining room leads to the spacious kitchen with Charles Weiler cabinetry with crown molding and custom layouts; Stainless Steel JennAir appliances and XO Chimney Wall hood and Granite countertops. There is a mud room/laundry next to the 3 car garage. The first floor is rounded out with a Family room, Study and formal living room. Continue up the staircase to explore the upstairs: There are 3 spacious rooms with a shared bat and an optional bonus room over garage that could be a 5th bedroom. The Master Bedroom en suite with tray ceiling and angled windows in the sitting room makes for a wonderful place of rest. Large closets with Laminate closet millwork by Top Shelf Closets, and a master bath with 12 x 24 ceramic tile floors, granite countertops, double sinks, large soaking tub, separate shower stall and private commode area. Last, to trim off the home are 7' tall solid core doors, 5 1/2 Beaded baseboards throughout and 3 window and door casing. Quality, elegance and value are the cornerstones of homes built by Barley Homes. Lot #4 is also available for a 15k premium"
"Opportunities abound on this one of a kind property centrally located in the heart of desirable Doylestown Borough. Walking distance to restaurants, shops, movie theatre, parks and more. This unique complex includes 2 buildings. The main house which is 100 years old consists of a 5 bedroom home with a newer addition consisting of a 2 bedroom apartment. This building could easily be converted to a magnificent single family home or continued as an income producing property. The second house is a 3 bedroom, 2 ~ bath newer construction with open floor plan, chefs eat in kitchen, spacious bedrooms and lots of storage. There is also a lovely private terrace off of the dining area with a retractable awning perfect for seasonal outdoor entertaining in any kind of weather. The property is ideal for a family compound or as an investment. Plenty of off street parking and outdoor space is a huge bonus as this is rarely available in the Borough." "Impressive and stunning! A touch of Tuscany can be felt in this custom designed & built home that once was a modest ranch style house. Except for the original foundation and basement, it was built anew in 2008 and is now a stately 3-level residence with an incredible addition. Evident is the fine craftsmanship, highest quality products and standards that a discerning buyer will appreciate. Nothing was spared to make this a home of luxurious proportions. Built for grand scale entertaining and small, intimate gatherings, the stone and stucco exterior with brick accents creates a unique, handsome character. A stone mason lives here and did the stonework himself using real stone. Stucco was properly installed. Architectural details and features are numerous, including 4-zone radiant heat tile floors, inlaid oak flooring, over-sized windows, transoms, palladium windows. Natural light streams in & seasonal views are everywhere. Living room has fireplace with dry stack stone surround, Tennessee stone raised hearth, crown molding and French door into adjoining den/office with built-ins. From center hall, library or large tiled dining room, step into the huge jaw dropping tiled kitchen and family room with built-in bar section with same custom cherry cabinetry throughout the highly functional chef~s ~wow~ kitchen. Floor to ceiling pantry closets inset into a wall and plenty of cabinets, Dacor microwave and electric wall oven. Amazing one piece 9~x5~ granite slab on island that has a 5-burner Viking propane cookbo, professional hood and prep sink. Sub-Zero w/cherry paneling, desk area plus a peninsula with another seating area on family room side. Dramatic floor to ceiling stone fireplace is 18~ high. Flanking the fireplace are two French doors out to the elegant European-feel bluestone and brick patio with cement balustrades. An extraordinary setting overlooking the property. Exterior of stone fireplace is a beautiful anchor to the ambiance. Back hall has coat closet, mud"
"Last opportunity to build a custom home, in this enclave of luxury homes, with public sewer and natural gas in Central Bucks School district. For 20 years, Barley Homes has been building the upmost quality custom homes offering the finest materials starting with the exterior Lifetime dimensional roof shingles, Stone or brick veneer, stucco front per front elevation plan, and low maintenance HardiePlank siding on the sides and rear over HydroGap drainable house wrap. Inside, the Wrightstown floorplan begins with a covered porch entrance and two story foyer with painted riser staircase. 5 wide Engineered hardwood carries throughout the entire first floor of the home as well as the 2nd floor hallway. Off the foyer the dining room leads to the spacious kitchen with Charles Weiler cabinetry with crown molding and custom layouts; Stainless Steel JennAir appliances and XO Chimney Wall hood and Granite countertops. There is a mud room/laundry next to the 3 car garage. The first floor is rounded out with a Family room, Study and formal living room. Continue up the staircase to explore the upstairs: There are 3 spacious rooms with a shared bath. The Master Bedroom en suite with tray ceiling and angled windows in the sitting room makes for a wonderful place of rest. Large closets with Laminate closet millwork by Top Shelf Closets, and a master bath with 12 x 24 ceramic tile floors, granite countertops, double sinks, large soaking tub, separate shower stall and private commode area. Last, to trim off the home are 7' tall solid core doors, 5 1/2 Beaded baseboards throughout and 3 window and door casing. Quality, elegance and value are the cornerstones of homes built by Barley Homes. 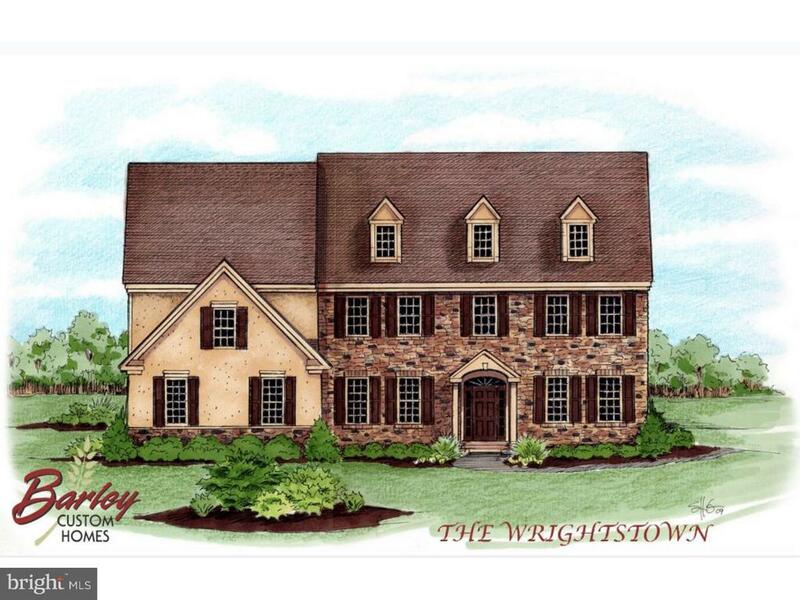 Lot #4 is also available for a 15k premium"
"Enjoy the convenience of living in Doylestown Borough along with luxury accommodations in this sophisticated, 4 bedroom, 3 full bath, 2 half bath custom built home. 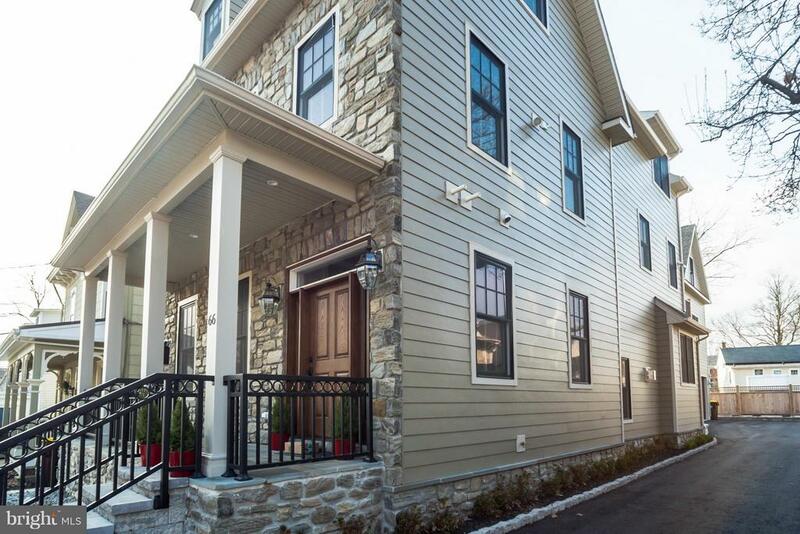 Nothing has been overlooked in creating this 3 story borough masterpiece. The exterior features custom stone work and Hardie plank siding as well as a full front porch with beautiful wrought iron railing. Enter through the welcoming foyer to find a bright, spacious, open floor plan. Luxury amenities include first floor 10~ foot ceilings, second and third floor 9~ ceilings, hardwood floors throughout the first and second floors, a large master bedroom suite with sitting room, deck off the master bedroom, oak staircase open to all 3 floors, gourmet kitchen w/GE monogram appliances, custom baths, gas fireplace in great room, and architectural woodwork and moldings. The full finished basement adds additional living space. This home features an attached 1.5 car garage and a rear courtyard with privacy fencing. Two stories above the garage you will find unfinished space offering potential for your home office, studio or in-law suite.Because of the open layout, there are no room sizes listed. Please refer to the attached floor plans for more information." "Awesome New Price & Buying Opportunity! Do Not Miss This One!The Crown Jewel of yesteryear's Doylestown Fairgrounds, this turn of the century 1906 home was completely rebuilt in 2013 to embrace the Arts & Crafts Style so popular when originally constructed. This design promotes an informal but cultured lifestyle with an open floor plan & light filled rooms that encourage interaction with the outdoors & is well suited for entertaining. From the Porch, Balcony & Windows, behold spectacular views of the prestigious Fonthill Castle and the Mercer Tile Works. This masterpiece is intrinsically simple yet sophisticated with exquisite craftsmanship as the Hallmark of the structure. The floor plan accommodates your decorating tastes & preferences from traditional classic to modern & eclectic. The gracious sun-kissed Living Room spills into a bright Sunroom from one side & adjoins your personal Pub from the other entry. The Pub is your signature Welcome Center for friendly exchanging of tales in front of the double sided Fireplace mirrored in the Living Room. A Formal Dining Room is to the right of the Center Hall Entrance for special occasions or anytime enjoyment. A cook's dream Kitchen is fitted for gourmet food preparation with a Banquette seating 8 for casual dining. A Powder Room, Butler's Pantry, Walk-in Pantry & Laundry/Mud Room complete this level. The Upper Level is your personal retreat with a fabulous Master Bedroom Suite & Bath. The Sitting Room has exterior Balcony on which to absorb magnificent ever-changing views of the Fonthill estate. Completing this level are 3 additional Bedroom En Suites, all amply sized & each with adjoining Bath. Above the Garage & accessed from the main level, are Separate Quarters hosting the 5th Bedroom & Bath PLUS Home Office. You define how best to use this space combination with endless Possibilities. Descend to the Lower Level via the Open Staircase on the Main Level. The perfectly finished area/Living Room hosts informal gat"
"Cozy Cottage is a perfect blend of horticultural and architectural splendor located in Stoneymead, one of the most prestigious neighborhoods in Buckingham Township, Bucks County. This special enclave of 26 custom homes was built by The Trueblood Company whose name is synonymous with excellence and quality craftsmanship. A gracious foyer welcomes you into this meticulously cared for and beautifully designed home with premium amenities and appointments, including wood floors, beautiful wood moldings and wainscoting. The living room/great room showcases a gas fireplace with antique mahogany mantle and marble surround, custom built in cabinetry, exquisite raised paneling with a satin patina and a craftsman dry bar. Two pairs of sliding doors open to a screened in porch overlooking the pond and landscape gardens with specimen plantings. Nature finds serenity here indeed! The spacious dining room has built in corner cabinets, crown molding, French doors that open to a lighted perennial garden and is perfect for hosting special gatherings. The chefs kitchen has cherry cabinetry, stone counter tops, microwave, large oven, warming drawer, Wolf appliances and pantry. Large breakfast room with reflecting sunset views over the pond is a perfect way to end your day. A first-floor bedroom with bath, walk in closet, built in cabinetry is currently used as a den/library. Second floor main bedroom has all the amenities one would require, plus two walk-in closets with dressing area and a sweet raised sitting alcove. French doors open to a private balcony overlooking the pond and its abundant wild life.Two other large bedrooms plus 2 full baths, many closets, built in cabinetry, laundry/hobby room and walk in cedar closet complete the second floor. Lower level features a family room with cabinetry, half bath, walk in closet, plus a separate exercise room and a large lighted basement for storage.Other features include radiant heat throughout, three car garage with expansive storage sp"
"Last opportunity to build a custom home, in this enclave of luxury homes, with public sewer and natural gas in Central Bucks School district. For 20 years, Barley Homes has been building the upmost quality custom homes offering the finest materials starting with the exterior Lifetime dimensional roof shingles, Stone or brick veneer, stucco front per front elevation plan, and low maintenance HardiePlank siding on the sides and rear over HydroGap drainable house wrap. Inside, the Bradley floorplan begins with a covered porch entrance and two story foyer with dining room on right side and study on the left. Staircase has painted risers. 5 wide Engineered hardwood carries throughout the entire first floor of the home as well as the 2nd floor hallway. Off the foyer is a delightful Hearth room with a two way fireplace to the spacious kitchen. The Family room shares a private patio with the morning room and also connects to the gourmet kitchen including Charles Weiler cabinetry with crown molding and custom layouts; Stainless Steel JennAir appliances and XO Chimney Wall hood and Granite countertops. Continue up the staircase to explore the upstairs: There are 3 spacious rooms with a shared bath and a large laundry room. The Master Bedroom en suite with tray ceiling and angled windows in the sitting room makes for a wonderful place of rest. Large closets with Laminate closet millwork by Top Shelf Closets, and a master bath with 12 x 24 ceramic tile floors, granite countertops, double sinks, large soaking tub, separate shower stall and private commode area. Last, to trim off the home are 7' tall solid core doors, 5 1/2 Beaded baseboards throughout and 3 window and door casing. Quality, elegance and value are the cornerstones of homes built by Barley Homes. 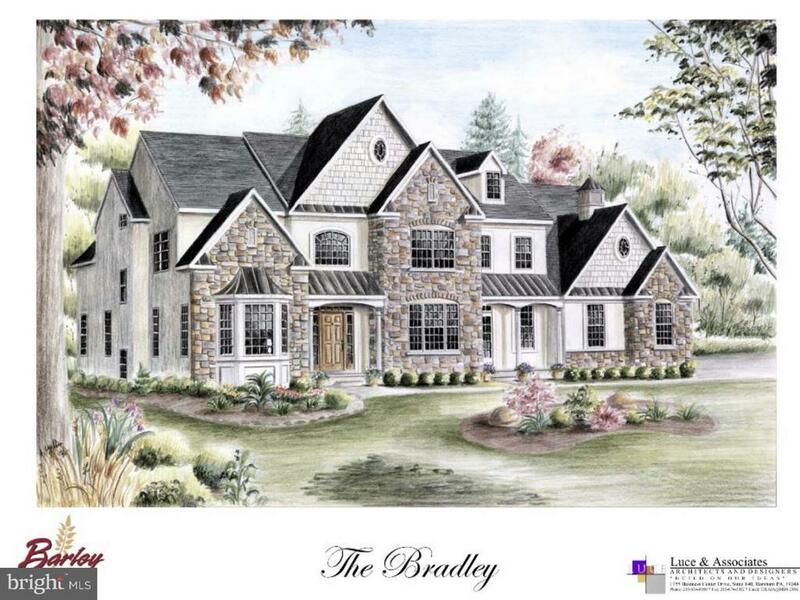 Lot #4 is also available for a 15k premium"
"Last opportunity to build a custom home, in this enclave of luxury homes, with public sewer and natural gas in Central Bucks School district. For 20 years, Barley Homes has been building the upmost quality custom homes offering the finest materials starting with the exterior Lifetime dimensional roof shingles, Stone or brick veneer, stucco front per front elevation plan, and low maintenance HardiePlank siding on the sides and rear over HydroGap drainable house wrap. 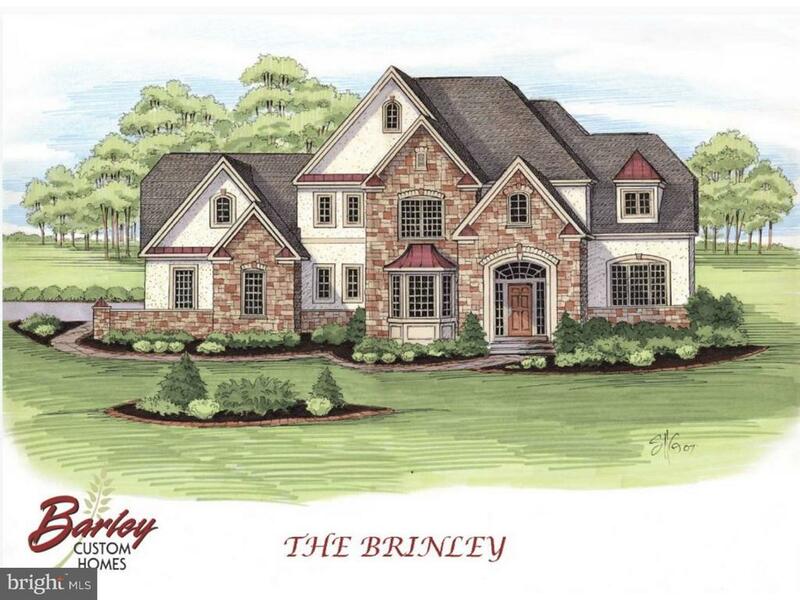 Inside, the Brinley floorplan begins with a grand 2 story foyer entrance and a handsome curved staircase, painted risers and dual access points to shared landing leading upstairs. 5 wide Engineered hardwood carries throughout the entire first floor of the home as well as the 2nd floor hallway. Off the foyer is a 1st floor study and formal dining room with access to the breakfast room and kitchen. The great room is the cornerstone of this home, featuring a gas fireplace and opens to the breakfast room, morning room, hearth room and gourmet kitchen including Charles Weiler cabinetry with crown molding and custom layouts; Stainless Steel JennAir appliances and XO Chimney Wall hood and Granite countertops. Off the kitchen is a spacious mudroom area with access to the laundry room. Choose the grand foyer staircase or the back staircase to explore the upstairs: The 2nd floor hallway overlooks the family room. One the one wing is a bedroom en suite with private bath and walk in closet. On the opposite side houses 2 additional bedrooms with a shared bath. The Master Bedroom en suite with tray ceiling and angled windows in the sitting room makes for a wonderful place of rest. Large closets with Laminate closet millwork by Top Shelf Closets, and a master bath with 12 x 24 ceramic tile floors, granite countertops, double sinks, large soaking tub, separate shower stall and private commode area. Last, to trim off the home are 7' tall solid core doors, 5 1/2 Beaded baseboards throughout and 3 window and door casing. " "The pleasures of a historical house are magnified when the home is in a one-of-a-kind setting. The Vicarage, just outside the village center of charming Carversville, is situated above the Paunacussing Creek. The property~s gardens and grounds were featured on the New Hope Historical Society~s annual garden tour and also have been the site of numerous celebrations and a few weddings (hence ~The Vicarage~ property name.) Its 2.7 acres are a mix of terraced, hardscaped outdoor spaces, including a heated in-ground pool and cabana, and carefully chosen perennials, flowering shrubs and mature trees that awaken each spring. An arched walking bridge over the creek is the perfect vantage point to note the carefully laid stones that formalize the edges of the waterway. Occasionally a few ducklings and their mama sail over a gentle waterfall in the stream. The house, which may have been a settler~s cottage originally, has grown several times over its 255-year history to become a very comfortable residence brimming with character in its moldings and millwork, windows, doors and exposed beam ceilings. A few important highlights include pristine, wide-plank pine floors, freshly refinished; an updated, eat-in kitchen outfitted with Living Quarters cabinetry, newer appliances and a bank of windows behind the sink looking out to the creek. It is one of the most pleasant views a dishwasher could ask for. A four-season sunroom off the kitchen overlooks patios and gardens. Just off the kitchen, the first-floor full bath with oversized steam shower is finished bottom to top in Carrera marble and subway tile. A sitting room, which could be used as a bedroom, a formal dining room with fireplace, and living room with walk-in fireplace, complete the main first-floor living spaces. Two staircases lead to the second-floor bedrooms, a series of unique and good-sized quarters, along with a recently updated hall bath. The main suite bedroom has superb views of the rear grounds through its wide "